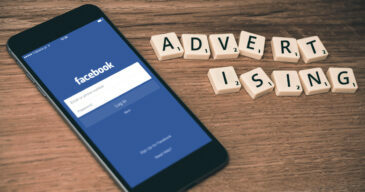 MailChimp is a powerful email marketing tool that allows you to collect, manage, and reach visitors of your site through their robust email templates and campaign tools. 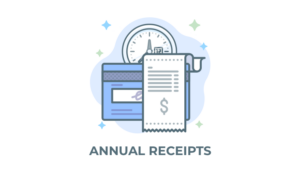 Note: You can always access your add-on purchase receipts, downloads, and licenses from your Give Account dashboard. After you’ve signed up for MailChimp, login and you’ll be presented with the MailChimp Dashboard. In the upper right-hand side you’ll see your name. Click on that and a dropdown will appear. Click on the menu item titled Account. On the Account screen, you’ll see a series of horizontal menu items. Click on Extras and a dropdown will appear. Click on API Keys. Scroll down the page a bit until you get to the section called Your API Keys. There, click on the button titled Create A Key. A Key will be auto-generated for you. You’ll see the date the Key was generate, the name of the person on your team who generated it, how it is labeled, the Key itself, a link for that keys QR code, and a link to disable/enable that particular key. Now that you have your API key, copy it and go to your website’s WordPress Dashboard and navigate to “Donations > Settings“. From there, click on the Add-ons tab. 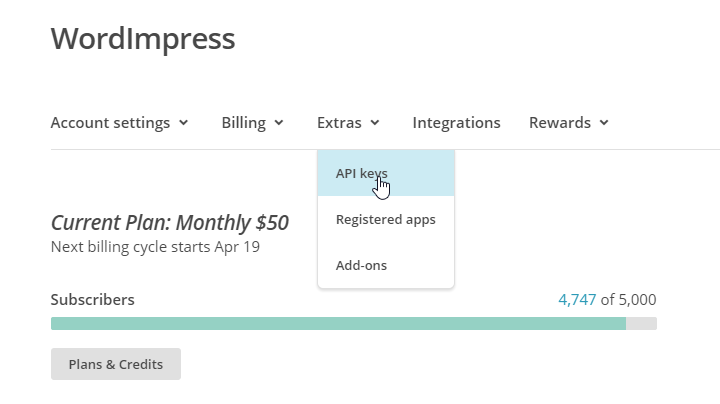 The very first field is where you can paste your MailChimp API Key. Once it’s pasted, hit save immediately. That will save that key and force Give to look for a connection to your MailChimp account. That allows the Default List field to be populated with your MailChimp lists. Double Opt-in — If this is enabled MailChimp will email any donor who opted to be added to your list and ask them to click a link to confirm again that they really do want to be added to your list. This can be very effective in making sure your list is very strong and not filled with potential spammers. Enable Globally — Enabling this sets these settings as the default for all your forms, both existing and future. This can be overridden per form as well. Default List — This sets the global default for which of your MailChimp lists your donors will be added to when they opt-in on one of your donation forms. Default Label — This sets the global default language for how the opt-in is described. This can be overridden per form. 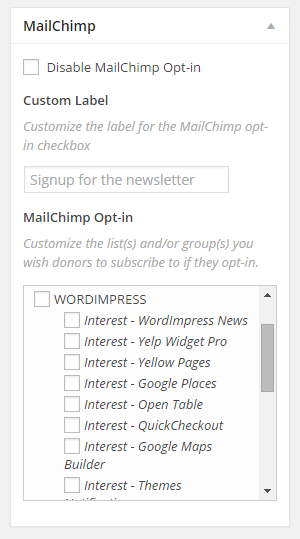 Did you know that each Give Form can subscribe your donors to a different list within your MailChimp account? 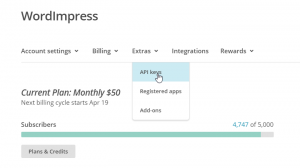 Now that you have MailChimp integrated with Give and have set your global settings configured, you can now configure each form, or new forms to use MailChimp in different ways. Note: Any changes you make on individual forms will override the Global settings you just set. If you want your form to inherit the settings from your global settings, simply don’t change anything for your individual form and it will take those settings. 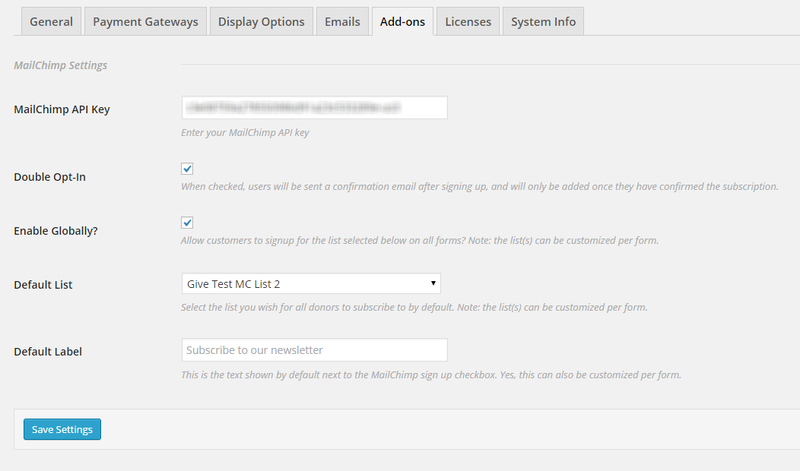 To configure MailChimp settings per form, simply go to Edit the form you want to configure. Now with the MailChimp Add-on activated and configured, you’ll see a metabox in the right-hand sidebar called MailChimp. The following options will be available in that section. 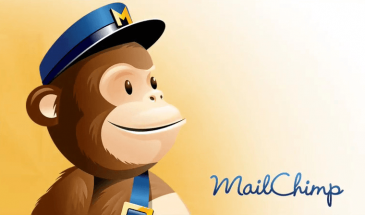 Disable MailChimp opt-in — This will disable MailChimp from being available to this form completely. Custom Label — You can change how the opt-in to MailChimp description is worded with this option. Type in whatever you like and this form will reflect that label instead of the global label. Leave it blank and it will inherit the global instead. MailChimp Opt-in — If you want this form to be attached to a different list or lists, select them here. Leave these blank and the global list or lists will be used instead.